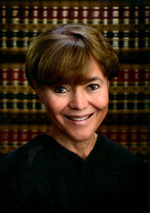 Justice Collins was appointed by Governor Jerry Brown to the California Court of Appeal in 2014. She received an “exceptionally well qualified” rating from the Commission on Judicial Nominees Evaluation and was unanimously confirmed by the Commission on Judicial Appointments. Justice Collins was appointed by President Clinton as a United States District Court Judge for the Central District of California in 1994. She served as Chief Judge of the Central District from 2009 through September 2012. Justice Collins was born and raised near Philadelphia, Pennsylvania. Her family had a strong tradition of public service, which inspired her to seek a career in the law. Justice Collins graduated from Howard University, where she was named Woman of the Year and elected to Phi Beta Kappa. She subsequently received a Masters of Arts in Government and Public Administration from American University in 1979. After moving to Los Angeles, Justice Collins worked for two years as the Director of the Norman Topping Student Aid Fund at the University of Southern California. She then attended U.C.L.A. Law School, where she was a member of the U.C.L.A. Law Review and Order of the Coif. During her second summer in law school, Justice Collins clerked for the Los Angeles County District Attorney’s Office. After serving as a staff attorney for the Los Angeles Legal Aid Foundation, she joined the District Attorney’s Office in 1978. Justice Collins was the first African-American woman to become a Head Deputy, Assistant Bureau Director, and Assistant District Attorney in that office. She was elected President of the Association of Deputy District Attorneys in 1984. Justice Collins received the U.C.L.A. Alumni Association’s Professional Achievement Award in 1997 and was the UCLA Law School Distinguished Alumnae of the year in 2018. She was awarded the Ernestine Stahlhut Award from the Women Lawyers Association of Los Angeles (WLALA) in 1999. She received the Outstanding Jurist Award from the Los Angeles County Bar Association (LACBA) and the Joan Dempsey Klein Distinguished Jurist Award from California Women Lawyers, both in 2012, and was a recipient of Loyola Law School Fidler Institute Award Judge of the Year in 2013. Justice Collins has also received both the Loren Miller Lawyer of the Year and the Bernard Jefferson Justice of the Year awards from the John M. Langston Bar Association. The City of Los Angeles presented Justice Collins with a Hall of Fame award during its African-American Heritage Month celebration in 2016, and she was the 2017 recipient of the Friends of the Los Angeles County Law Library’s Beacon of Justice Award. In 2019 she was the recipient of the Beverly Hills Bar Association’s Ronald M. George Award for Judicial Excellence. In 1992, Justice Collins served as a Deputy General Counsel on the Webster-Williams Commission, appointed to investigate the LAPD’s response to the April 1992 civil disorder in Los Angeles. She chaired the LACBA Task Force on the State Criminal Justice System, which recommended improvements within the criminal justice system in the aftermath of the LAPD Rampart investigation, from 2002 through 2003. Justice Collins has served on the WLALA Board of Governors and the Board of Directors of the Association of Business Trial Lawyers. She previously chaired the LACBA Criminal Justice Section and served as a member of LACBA’s Board of Trustees and the Executive Committee of LACBA’s Litigation Section. Justice Collins also served on the State Bar Committee of Bar Examiners, and is a member of the National Association of Women Judges. She is a lifetime member of the WLALA, California Women Lawyers, National Bar Association, Association of African American California Judicial Officers (AAACJO), Langston Bar Association, and Black Women Lawyers Association of Los Angeles. Justice Collins is married to Timothy Collins, a native of Los Angeles. They have two adult children, both of whom reside in Los Angeles. Justice Collins enjoys spending time with her children, reading, walking and yoga.